The LEAF team is however not finished; we are currently working with external partners on the next steps required to bring this technology all the way to the market and end-users. Final reports from the project are under preparation and will be made publicly available within a couple of months. So stay connected and look for the latest LEAF developments here and on our Facebook page. We would also like to take the opportunity to thank all the LEAF partners and all the boat owners who volunteered to take part in the all-important demonstration activity. Photographs from a motor boat yacht in Grado’s lagoon, Italy (Venice area) taken 2 and a half months after boat launching in the lagoon’s warm water. As can be seen in the upper-left the catodic protection surface is fully colonized by tubeworms, indicating high fouling pressure this season. Also the white paint on the engine anchoring structures suffered from marine bio-fouling. 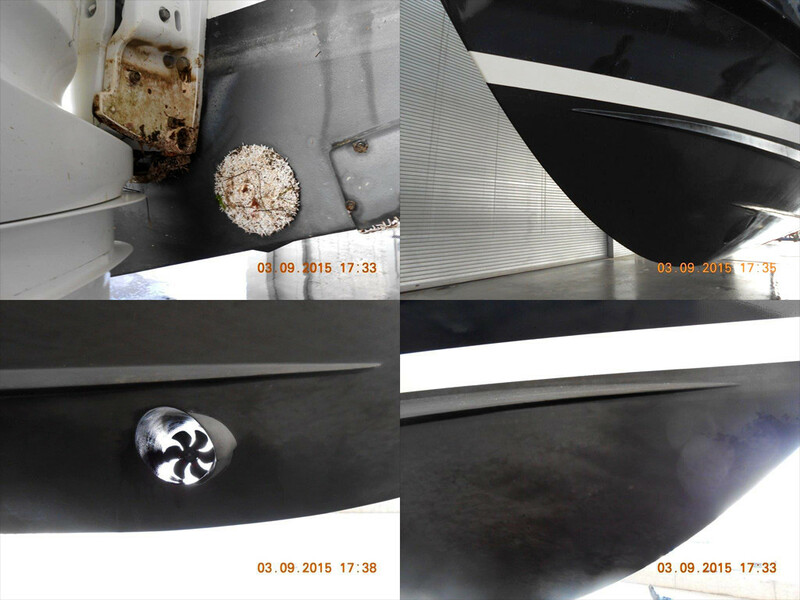 The LEAF prototype (black paint) shows a very good antifouling efficacy in all pictures. According to the boat owner the LEAF paint performs better than commercial product used previous seasons. According to the boat owner this boat remained in port, moored, for the last three weeks before photo shooting. This is a very demanding condition for the AF paint in any water and in particularly in hot lagoon water. This entry was posted in Uncategorized on 11 January, 2016 by admin-leafantifouling. A total of 57 volunteering boat owner, and two Ro-Ro ferry boats are now testing the LEAF prototype paint under real conditions. The demonstration activity is going on in the Baltic, North Atlantic, English Channel, Mediterranean Sea, subtropic South Atlantic, and Carribean Sea. We are excited and looking forward to feedback from the boat owners. You can follow this on a daily basis on our Facebook page. This entry was posted in Uncategorized on 28 May, 2015 by admin-leafantifouling. 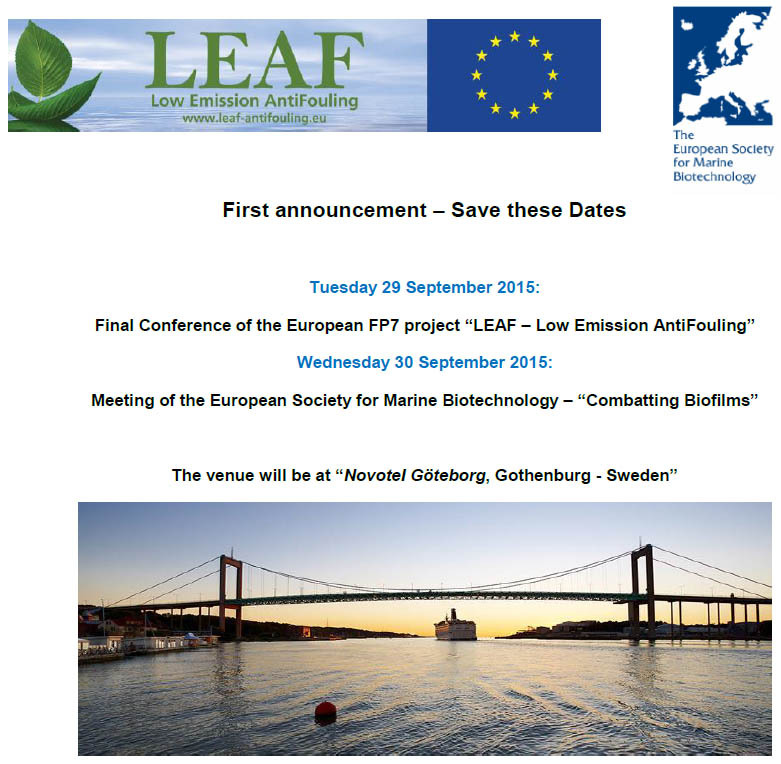 Join us i Gothenburg in September 2015! This entry was posted in Uncategorized on 29 April, 2015 by admin-leafantifouling.